The Kiwi (Apteryx) is a flightless, nocturnal bird native to New Zealand. Depending on the species, kiwi can live between 25 and 50 years. The females grow larger than the males, and can often grow to 3.3kg. The scientific species name, Apteryx means ‘wingless’ in Latin. The kiwi belongs to an ancient group of birds that cannot fly – the Ratites. Other ratites include Australia’s emu and cassowary, as well the ostrich. While most other bird species have hollow bones in order to minimise weight and make flight practical, the kiwi does not fly and thus, has marrow in its bones. Proportional to body size, the kiwi lays the largest egg of all bird species. The females carry and lay a single egg which may weigh up to 450g, roughly 15% of the mother’s body size. The kiwi is approximately the same size as a domestic chicken, yet is able to lay an egg on average, six times the size of a chicken’s egg. Kiwis tend to live their entire lives as a monogamous couple. During mating season (June-March) the pair call to each other through the night, and will meet in the nesting burrow every three days. Once an egg has been laid, the father of all species of kiwi, except the Great Spotted Kiwi, incubates the egg. The relationship between kiwi couples lasts approximately 20 years. Kiwi have a highly developed sense of smell, and are the only birds with nostrils at the end of their beak. As a result of having nostrils located at the end of the beak, kiwis can locate prey underground with their keen sense of smell, without actually seeing or feeling the prey. Kiwi eat small invertebrates, worms, grubs and insects, as well as seeds and fruits. Kiwi are nocturnal, and hunt during the night. During the day they nest in burrows, hollow logs or under dense vegetation. The kiwi is the national bird and icon of New Zealand. Kiwi are a symbol of the uniqueness of New Zealand’s wildlife, and are valuable to New Zealand’s natural heritage. The association of the kiwi is so strong, New Zealanders are affectionately known as ‘kiwis,’ both internationally and locally. 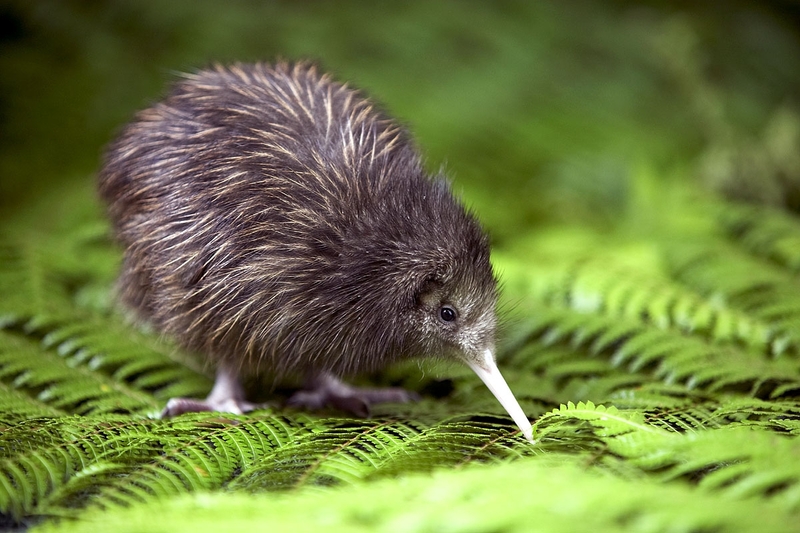 Yet, despite affectionately naming ourselves as kiwis, most New Zealanders have never seen a kiwi in the wild. The colonial invasion of New Zealand in the 17th Century, brought with it. Invasive mammals pose a great threat to the conservation and wellbeing of kiwi. Currently, there are approximately 70,000 kiwi in New Zealand. However, an average of 27 kiwi are killed by predators every week – that’s a population decline of 1,400 kiwi per year, or 2% of the population. Approximately 20% of the kiwi population is under management by the Department of Conservation – this includes breeding and release programmes, as well as predator control. In areas where the predator population is controlled, the chick survival rate is 50-60%. On average, only 5% of kiwi survive, in areas not under management. In order to see a population increase of kiwi, a survival rate of at least 20% is needed, so the conservation of kiwi is definitely an achievable task with the appropriate predator controls. The kiwi is possibly the most fascinating bird on the planet, and this proud kiwi sure can’t wait to meet a kiwi in the wild!